Location: National Gallery of Art, Washington. John 20:19-23 On the evening of that first day of the week, when the disciples were together, with the doors locked for fear of the Jewish leaders, Jesus came and stood among them and said, “Peace be with you!” After he said this, he showed them his hands and side. The disciples were overjoyed when they saw the Lord. Again Jesus said, “Peace be with you! As the Father has sent me, I am sending you.” And with that he breathed on them and said, “Receive the Holy Spirit. If you forgive anyone’s sins, their sins are forgiven; if you do not forgive them, they are not forgiven”. In visual terms, this work tells us about the things that influenced Blake as an artist. The sinuous curves that roll over the backs of the disciples recall similar effects in Gothic art (which Blake had studied during his apprenticeship). However, Blake’s typically muscular figures demonstrate other inspirations at play, owing much to the Renaissance master Michelangelo. 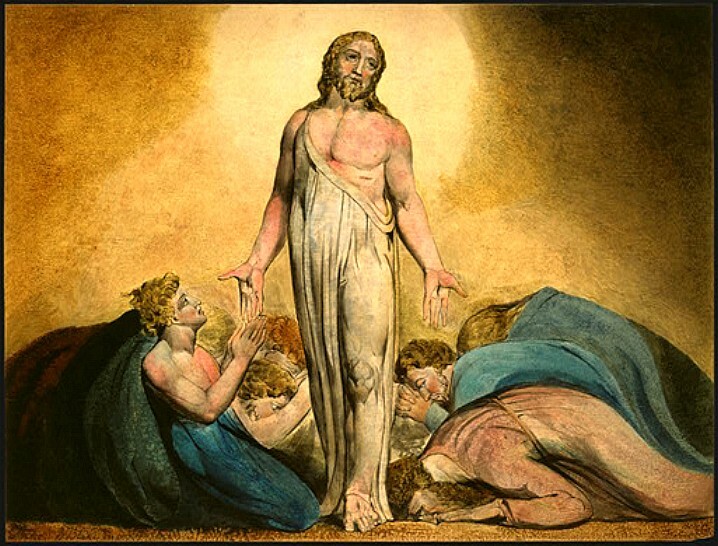 Here, the body of Christ is firmed up and thickened, backing up Blake’s belief in the resurrection. Although the stigmata and signs of physical suffering are showing, the muscled shoulders, defined thighs and solid arms add visual weight and vital credence to this cornerstone of Blake’s faith. This image does exude a sense of intimacy, with the huddle of heads, grinding and groveling (some are even flush to the floor), an odd (and totally engaging) backdrop. The syrupy glow that emanates from Jesus sets a definitive mood too. The warm flesh tones on the exposed bits of body flush fierce focus-on-the-physical into the picture. And Christ’s (just) larger than normal eyes could make someone look at this with new eyes. William Blake (November 1757 – August 1827) was an English poet, painter, and printmaker. Blake is considered a seminal figure in the history of both the poetry and visual arts of the Romantic Age. In 1788 Blake developed a process of etching in relief that enabled him to combine illustrations and text on the same page and to print them himself, thus ensuring complete independence of thought and expression. Four illuminated books appeared between 1789 and 1794. Many of his large independent color prints, or monotypes, were done in 1795. His work was largely neglected for a generation after his death and was almost forgotten when Alexander Gilchrist began work on his biography in the 1860s. It was in the twentieth century, however, that Blake's work was fully appreciated and his influence increased.